The heart has 4 chambers. It has 2 upper chambers (atria) and 2 lower chambers (ventricles). Electrical signals regulate the heart beat. The signals also help the atria and ventricles work together in the same rhythm. 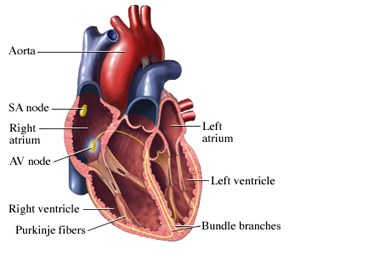 The blood from the atria is pushed into the ventricles and leaves the heart to circulate to the rest of the body. Atrial flutter is a type of abnormal fast beating ( arrhythmia ) in the atria. These fast beats make it difficult for the atria to push all the blood into the ventricles. As a result, the ventricles push less blood through the body. Atrial flutter may be an acute or chronic disorder that comes and goes. Atrial flutter is not usually life-threatening when it is treated. However, it may increase your risk of developing blood clots and a stroke . Atrial flutter is more likely to develop in older adults. Your doctor will ask about your symptoms and medical history. A physical exam will be done. Your doctor may also recommend that you see a cardiologist or arrhythmia specialist. This type of physician may be found in a larger hospital. Other medications called antiarrhythmics may be used to change the rhythm back to normal. They may also help your heart maintain a normal rhythm. An external defibrillator is applied to the chest. It uses an electrical current to shock the heart back to its normal rhythm. Ablation can be performed during an electrophysiological study (EP) study on patients with recurring atrial flutter that cannot be controlled with medications. Using the same catheters, an area of the heart where an abnormal electrical rhythm is generated can be destroyed. This can be a cure for atrial flutter. Blood thinners are an important therapy to prevent blood clots that can cause strokes or other serious complications. They can be used on those who have recurrent atrial flutter. They can also be used on those who are at an increased risk. Atrial flutter. EBSCO DynaMed Plus website. Available at: https://www.dynamed.com/topics/dmp~AN~T115251/Atrial-flutter . Updated February 22, 2017. Accessed November 28, 2017. Atrial flutter. Heart Rhythm Society website. Available at http://www.hrsonline.org/Patient-Resources/Heart-Diseases-Disorders/Atrial-Flutter#axzz3MHkY4esv. Accessed November 28, 2017. Other heart rhythm disorders. American Heart Association website. Available at: http://www.heart.org/HEARTORG/Conditions/Arrhythmia/AboutArrhythmia/Other-Rhythm-Disorders%5FUCM%5F302045%5FArticle.jsp#.Wh2p2VWnFxA. Updated December 21, 2016. Accessed November 28, 2017.